At the airport, every person has a story: a series of choices that brought them to that moment of waiting for the plane. Maybe they had a great morning or maybe it was terrible; maybe this is a fun trip or maybe it’s just for work. Everyone has a story and a reason for their actions and when you start to watch people, you realize just how tiny you are in the grand scheme of things. I’m not sure why I like to people watch though it could be because I’m part German. A few years ago I had the opportunity to go work with US Military kids over in Germany and was warned that, culturally speaking, it is completely normal for Germans to stare at you and not say anything – so we shouldn’t freak out. When sitting at a McDonalds in the airport with the rest of my team, there was an individual who sat a few tables away and just stared at us. For like 5 minutes. It was a bit odd at first but I was also jealous: if I tried that in the States, I would get punched in the face. Except for at the Airport. I guess the reason why “being watched” has been on my mind, other than the fact that it is all over the news due to the NSA, is that while everyone is freaking out about not having privacy, I am somewhat used to being watched and have operated under the assumption that what I do is being observed for the better part of my life. I’ve mentioned before that I grew up as a Pastor’s Kid. Many PKs are used to being entrenched in a certain church culture, not the least of which includes being watched. People watch us like we’re some reality tv star – they want to see when we succeed and when we fail; when we break and when we stand strong; when we exceed expectations and when we miss the mark. Even the nicest of parishioners do it – they want to know if their Pastor’s kids behave like they “should”. For a long time I was angry about this expectation but as I grew older I saw the benefit to being used to being watched. See, when you’re aware that you’re being watched, you are aware of how you act and you’re more careful with your actions. With most every action you take or word you say, you have thought it through (maybe not completely… but some of the way). There was a night back during my trip to Germany where I had an epiphany regarding being watched. 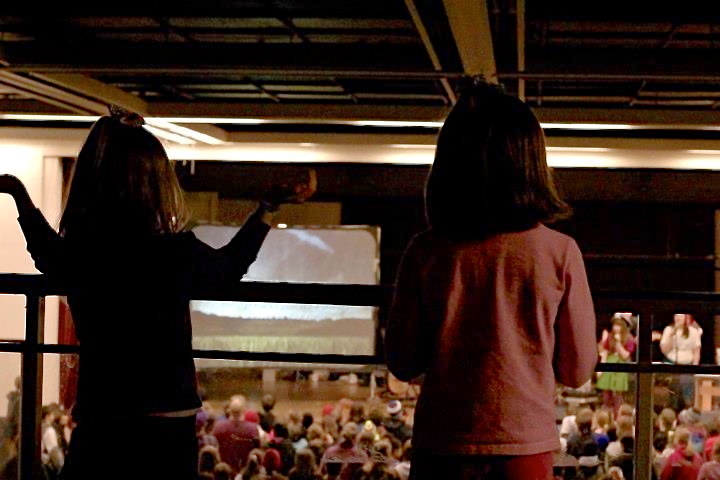 I was sitting in the back of the event hall during Worship when I looked up and saw a couple young kids in the balcony. They looked to be under 7 years old and were watching all the jr highers down on the main floor. I then realized that those jr highers were watching the high school students on stage who were leading worship. Continuing this line of thinking, those high school kids had been watching us college students all week as they prepared to serve alongside us in putting on the camp for all the jr highers. I captured all of this in the photo you see up top (I was really bummed about the shot later when I realized how under exposed it was – that room had terrible lighting). My epiphany was this: every person, not just those who are PKs, is always being watched no matter what age they are so we should always behave as such. How you act not only reflects on you but reflects on your family, friends, and your faith and influences how they grow and mature. I don’t like what the NSA is doing and the whole situation makes me upset. However, regardless of the government watching us or not, other people always are – perhaps if we kept that in mind, we would be more apt to behave in a God-honoring way.